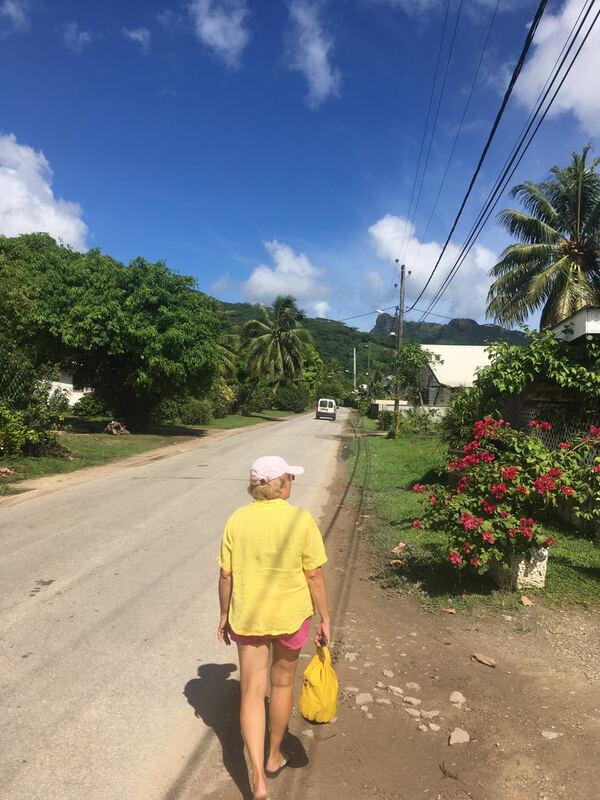 We do love Fare, the main village on Huahine. 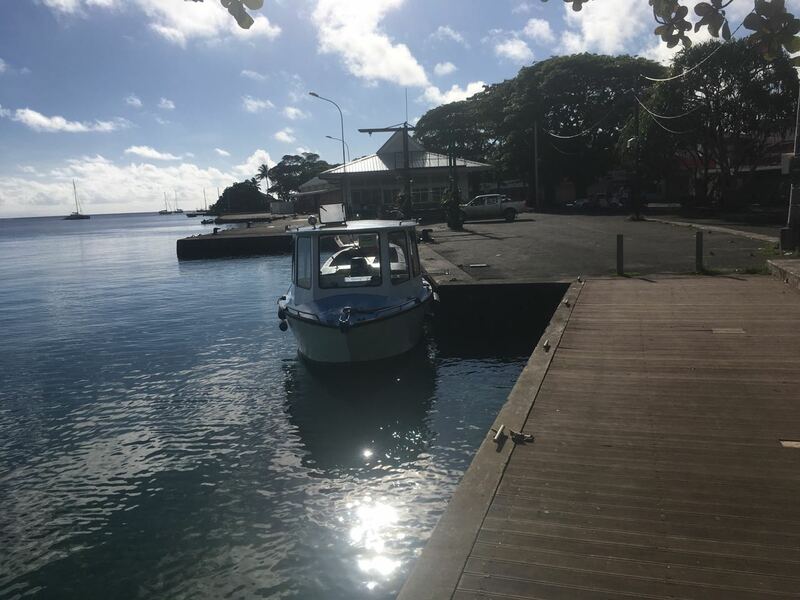 It's a supply hub for much of the island, although Tapuamu and Patio also receive a fair share of shipping. 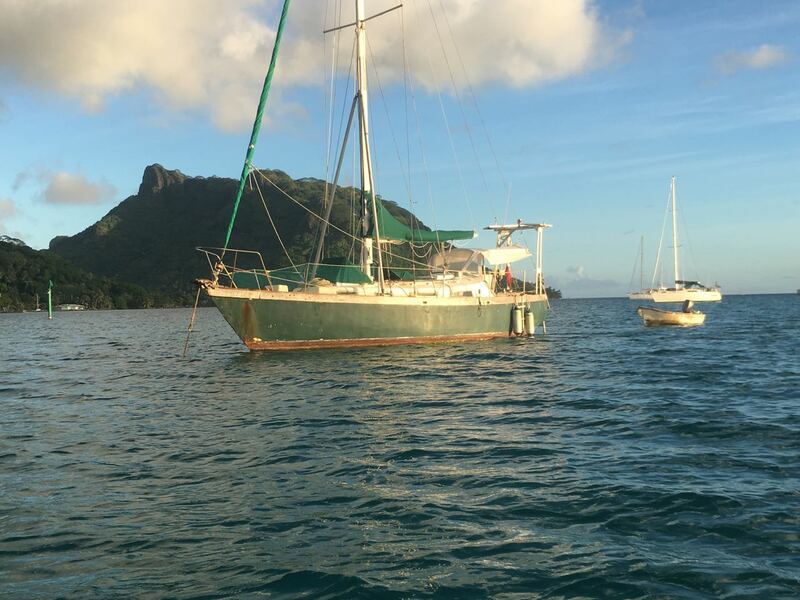 We were pulling the anchor in Fare and preparing to motor through the convoluted pass to D'Avea Bay further south on the island when I noticed that there was no exhaust water coming from the engine exhaust through hull. Oh, NOOOOOO! We turned around quickly, dropped the hook again, and shut down the engine. After some effort, we ascertained that the raw water pump had failed. What better place! My sister was flying to meet us in a few days, and she brought a replacement pump, or at least one that I could modify and use. Here are some photo that we took as we waited for Debbie and the pump. 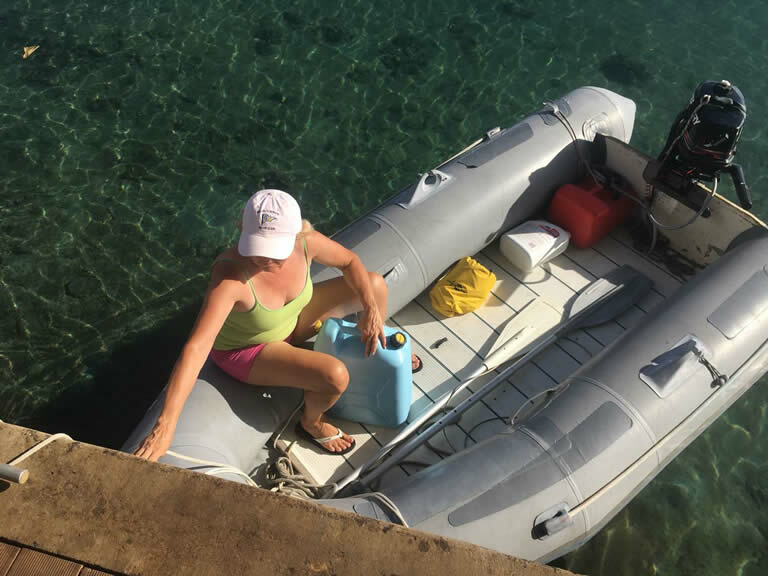 We had dinghied down to the dock in town to fetch more fresh water. Our dinghy is at left with the blue water jug. 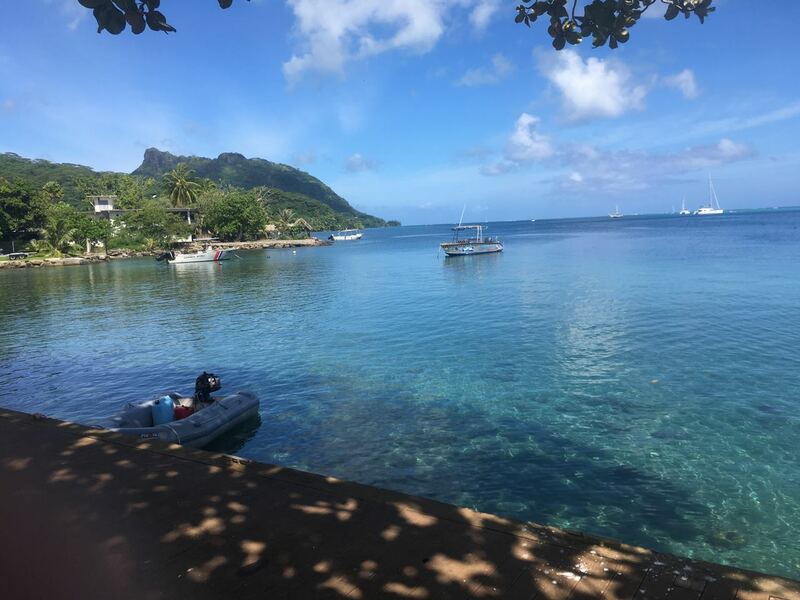 Isn't Huahine beautiful? The island is almost in two pieces, the smaller one visible in the background. Conni and I took every opportunity to stretch our legs and enjoy the lovely town. This is not a great photo, I know, but it's what I could do with an iPhone camera. 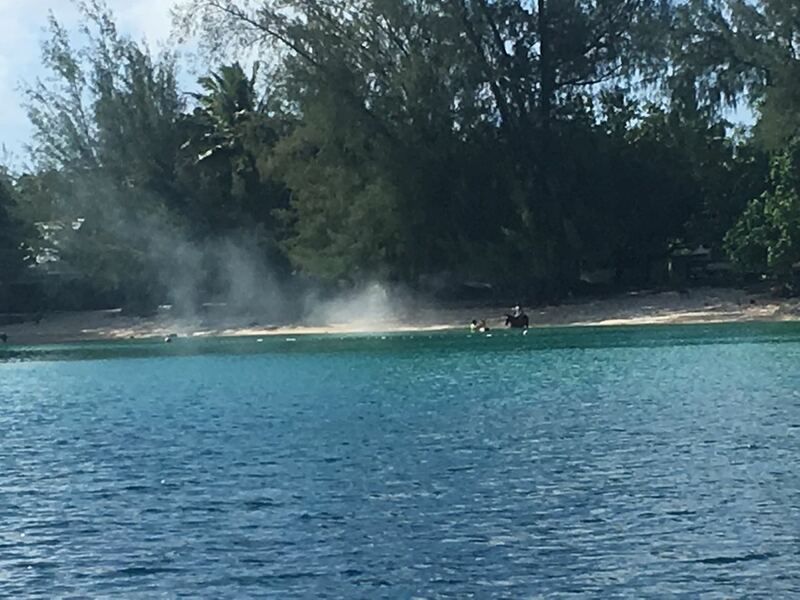 This is a horse gladly joining local swimmers in the salt water. No one seemed to be surprised but I've never seen it before. 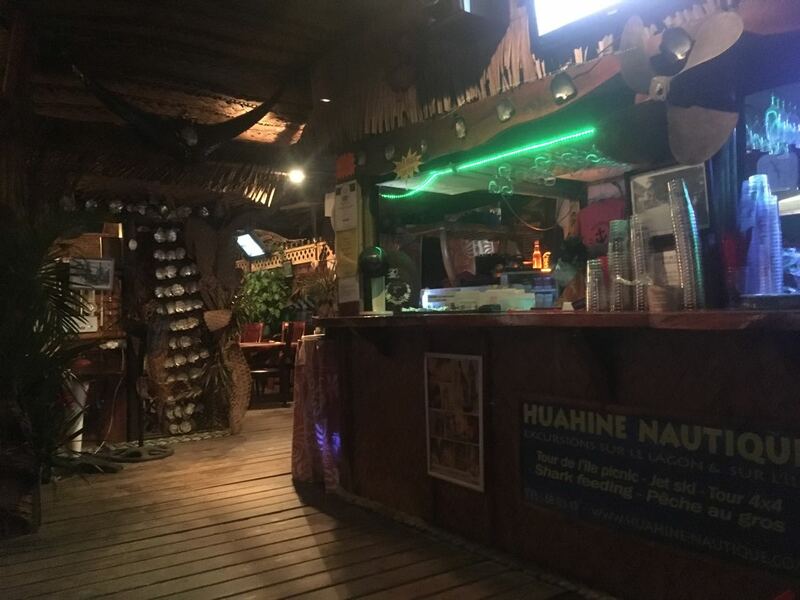 The inside of the Huahine Yacht Club, in which we spend several relaxes afternoons. 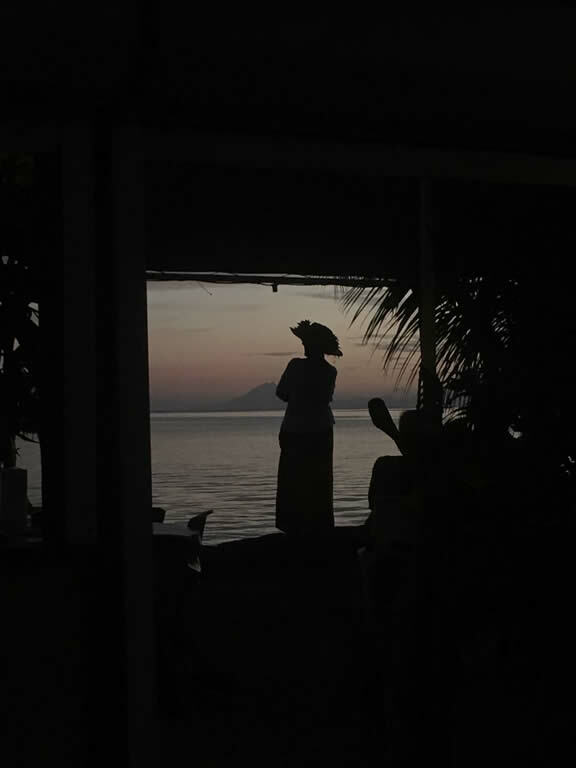 A local woman was gazing at the sun setting behind Raiatea in the background. Another water trip as Conni waits to hoist the empty jug to me. Standing above the dinghy and Conni, I turned and snapped this late-afternoon photo of Fare's dock area. 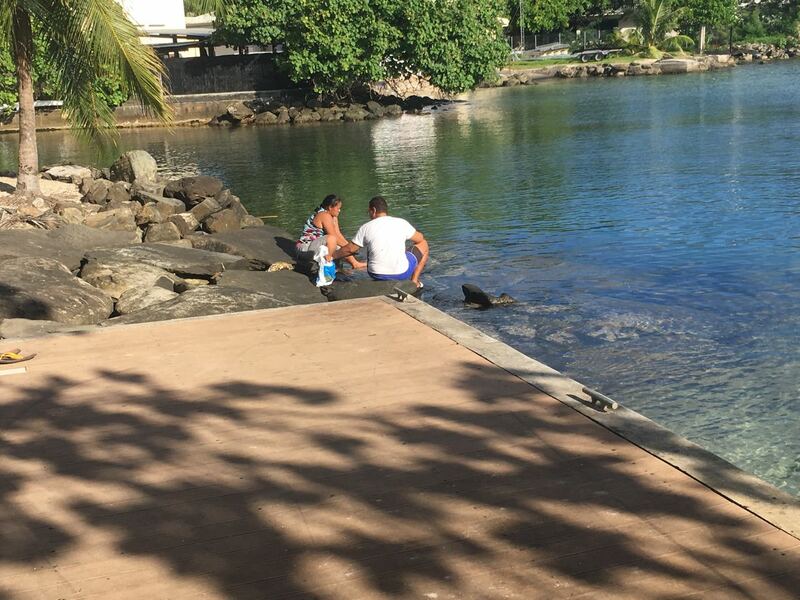 This local couple was cleaning fish and a lot of interested local fish enjoying the tidbits they left behind. 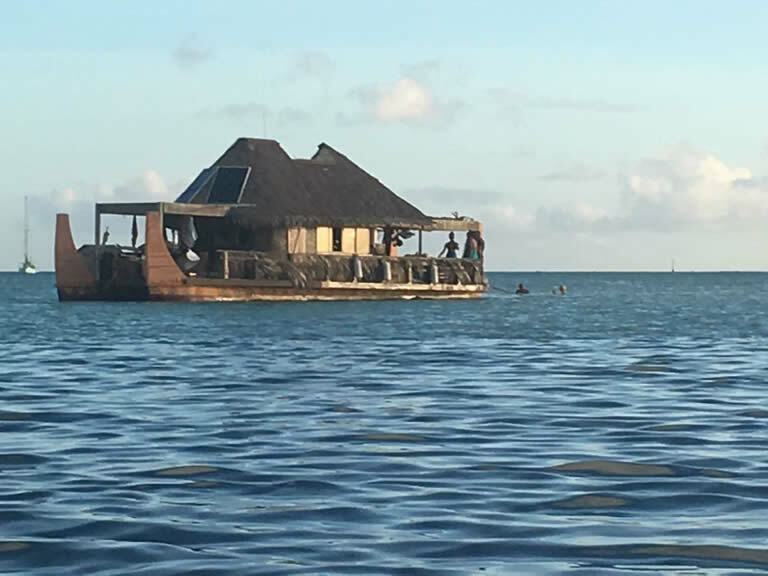 Looked like a bar to us, so we hopped in the dinghy to have a cocktail. Nope. 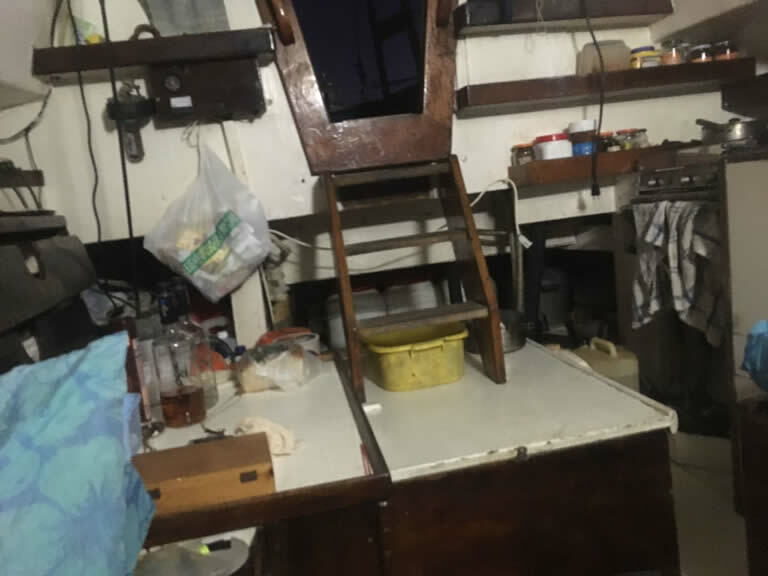 It was a private home, just on a boat hull. The people at the stern are STANDING, so it's anchored in shallow water! This is the home-made steel boat owned by a new friend, Roy Starkey, author, cruiser for 50 years, artist, and odd guy. He lives on $1200/year so never uses a mooring. Roy greets us from the cabin. 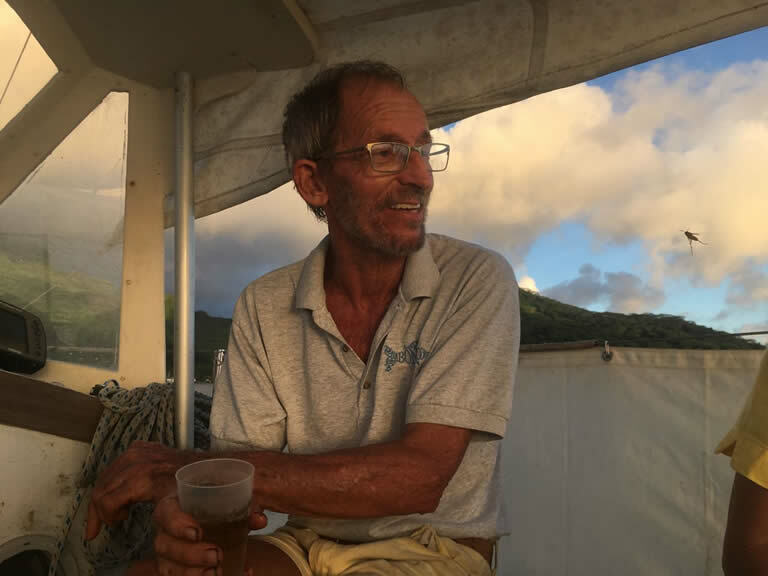 Roy is a terribly interesting guy, having cruised the South Pacific for most of his 80 years. 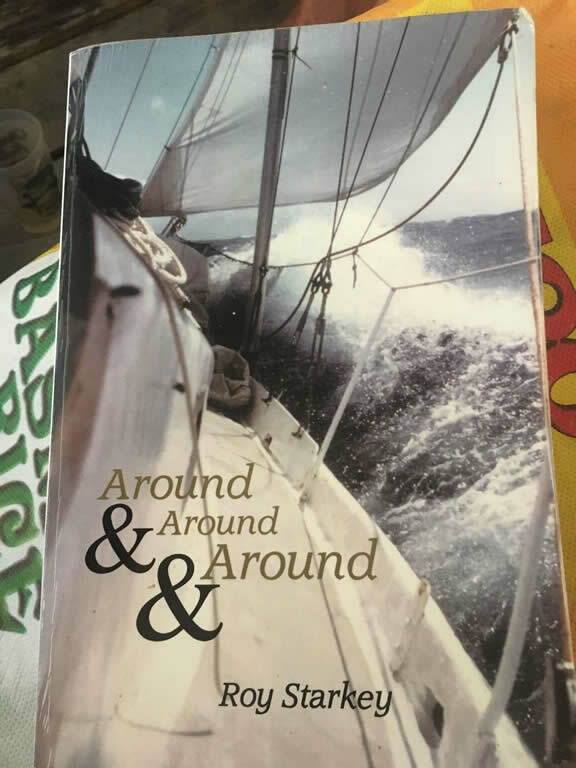 This is Roy's book, "Around and Around, and Around". 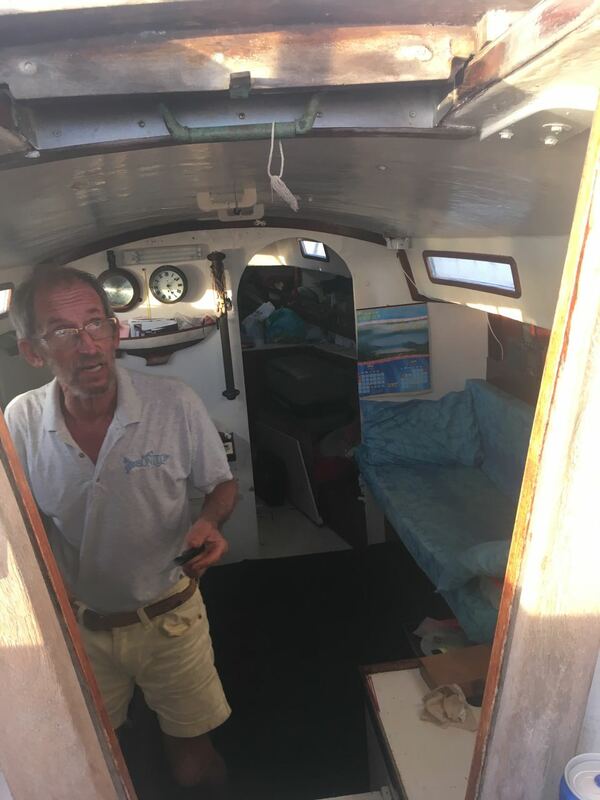 A view from inside the cabin through his companionway. It's not primitive, but it is simple.